Not Sure What Product You Have? Search by identifying tags, serial numbers and/or Manufacturer names often located on the back or lower front corner of each unit. These tags may provide clues to the type of box which is installed. 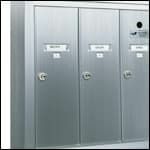 These taller doors are typically used in apartment building mailboxes, usually up to no more than 7 doors per mailbox cabinet. These doors are more square or slightly rectangular, and are used in commercial or residential buildings. These doors can be in several row and column configurations. 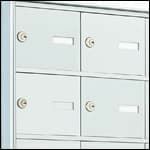 These doors are much wider, and are typically used in newer cluster boxes or STD-4C mailbox units. These units are usually installed in residential neighborhoods, or in newer multi-tenant buildings. 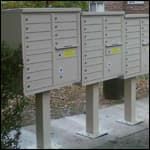 You can also identify your mailbox by the way it's installed. 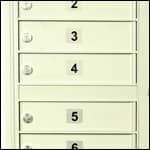 The following installation examples should help you identify your current mailbox. 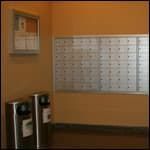 Several types of mailboxes are installed into an wall, or mounted directly on it. Some installations open from the back inside a mail room. 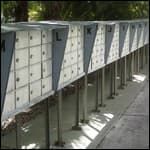 These mailboxes can be used for USPS or private mail delivery. Other mailboxes are installed free-standing on a pedestal. 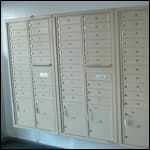 Older mailboxes (such as NDCBUs) have been replaced by CBUs (cluster box units) and pedestal-mount 4C mailboxes.